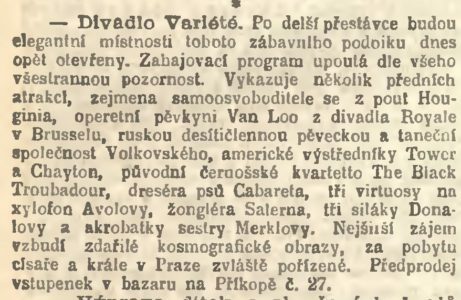 As we reported in our most recent post, Houdini came to Prague only once, in September 1901. He was contracted to perform there by Edward Tichy, the famous director of the Théater Varieté, known today as the Karlín Theatre. The Karlín Theatre is the third oldest Prague theatre building still serving its original purpose, after the Estates Theatre and the National Theatre. The original building was developed by Prague businessman Eduard Tichý from 1880 to 1881 and was designed by German architect Otto Ehlen (1831-1898) in the spirit of late Historicism. The firm of František Kindl constructed the building. The theatre was opened on August 27, 1881. Eduard Tichý had the intention of renting the building to various travelling troupes and circuses, with the space able to be transformed into a circus ring when needed. The theatre facilities included stables for up to 84 horses. The original auditorium had a capacity of 2,000 people, with viewers having the option of sitting at tables where refreshments were served. The founder’s oldest son, Karel Tichý, came up with the idea of transforming the building into a permanent variety theatre. The theatre inaugurated a new era on September 5, 1885 when a new repertoire was introduced. After the death of Eduard Tichý in 1891, his sons took over operation of the organization. In 1897 Eduard Tichý Jr. undertook renovation of the theatre according to plans created by Imperial Court architect Friedrich Ohmann (1858-1927). The reconstruction of the original Karlín variety theatre mainly involved the inner spaces of the building. The relatively plain interiors were furnished with rich Neo-Baroque décor. Houdini always wanted to break records, and was keen to make a big name for himself wherever he could. 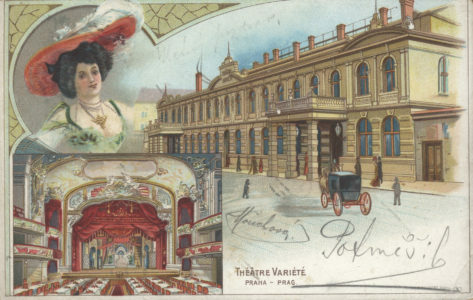 When Eduard Tichý invited him to be the sensational inaugural opening act at the renovated Theatre Varieté, Houdini readily agreed. 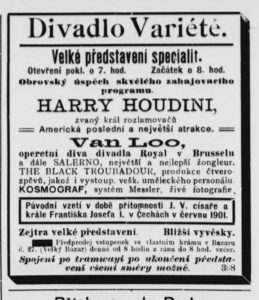 Just as in Vienna, Houdini’s debut was publicized in the newspapers, starting on August 31, 1901. Great performance of specialities. Ticket-office opens at 7:00 p.m. Performance starts at 8:00 p.m. A successful and splendid opening programme. Harry Houdini, called king of breakers. Last and the biggest American attraction. Van Loo, the light opera diva from the theatre Royal of Brussells, also Salerno, the best and biggest juggler. The Black Troubadour, performance of four vocals as well as the performance of all art staff. Kosmograf, system Messler, living photos. Tomorrow a great performance. Closer notice. Houdini was in Prague for a week, performing between September 8th and 15 th. He admittedly broke no records, and this is probably why he never ever returned. Houdini’s next contract in Eastern-Europe finally led him to Vienna. Wonderful Barbara! You know, a poster advertising this appearance sold at the Potter & Potter auction in February. Waiting on Vienna Part 2, then I will share links to these posts on my own blog. So little about these appearances are known. This is groundbreaking.